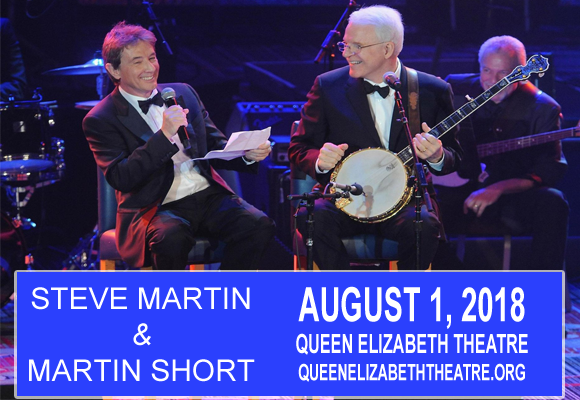 It's time for some good, old-fashioned bluegrass music and some absolute comedy gold as Steve Martin & Martin Short come to Queen Elizabeth Theatre on Wednesday 1st August 2018! The first in a two-night-stand with these Three Amigos co-stars and funnymen, you're guaranteed to enjoy "An Evening You'll Forget For The Rest Of Your Life"! Best known for his acting work in films like Father of the Bride, Steve Martin is an Emmy, Grammy, American Comedy and Honorary Academy Award-winning actor, comedian, writer, producer and musician. Beginning his career in the 1960s as as a writer for The Smothers Brothers Comedy Hour, Martin soon became a regular on The Tonight Show and had success throughout the '70s as a stand-up comic, regularly selling-out shows and national tours. Martin later diversified into the world of acting, appearing in several hit films, including: The Jerk, Planes Trains and Automobiles, Dirty Rotten Scoundrels, Three Amigos, Father of the Bride and Father of the Bride Part II. Martin is also an author, playwright, pianist, and banjo player, and released his first solo music album, The Crow: New Songs for the 5-String Banjo, in 2009, for which he won the Grammy Award for Best Bluegrass Album.